This past summer guitar legend Ritchie Blackmore finally heeded the call of long-suffering Rainbow and Deep Purple fans by returning, albeit briefly, to the hard rock by which he carved his name into music history. Prior to this year Blackmore had not played in a rock setting in more than 20 years, instead concentrating on renaissance music in Blackmore’s Night. But he resurrected Rainbow – with an all-new lineup – for three festival appearances in June. Unfortunately for us, the shows were in Germany and England. But now, stateside fans can enjoy Blackmore’s return with the DVD/2CD package, “Memories In Rock – Live In Germany” (Eagle Rock Entertainment). Following the familiar Wizard of Oz intro, Blackmore revs things up by opening with the Deep Purple proto-metal classic, “Highway Star,” before launching into Rainbow’s “Spotlight Kid” and back to Purple for the bluesy “Mistreated.” In another nod to the past, he dons his signature pilgrim hat. While the band performs under the Rainbow banner, the disc is almost evenly split between Rainbow and Purple tracks, sure to please fans of both bands. There are eight Rainbow tunes and six Purple songs. Blackmore shines on inspired versions of “Catch the Rainbow and “Man On the Silver Mountain,” which includes a well-deserved shout out to the late Rainbow singer Ronnie James Dio, the majestic “Stargazer” and “Difficult to Cure (Beethoven’s Ninth),” which spotlights his classical influences. From the Purple pantheon, melodic rocker “Since You Been Gone,” “Perfect Strangers” and “Child In Time” top the highlight list. It’s as if Blackmore never left the rock scene, his fluid, unique sound and familiar licks played at the high level that is his signature. While Blackmore is the focus, huge props go to singer Ronnie Romero. When Blackmore tapped the unknown Chilean vocalist to front the resurrected Rainbow, many fans scratched their heads, wondering if the guy could do justice to Ronnie James Dio, Graham Bonnet, Joe Lynn Turner, Ian Gillan and David Coverdale. Romero is not only up for the herculean task, he puts himself on the map as a spectacular, powerful singer. Not a sound-alike of any of the aforementioned frontmen, Romero puts his own stamp on the material. His clean, confident delivery especially stands out on the slower songs, bringing maximum emotion to “Catch the Rainbow,” bluesy grit to “Mistreated”and chills-down-your-back screams on “Child In Time.” He more than proves himself here as a perfect fit. 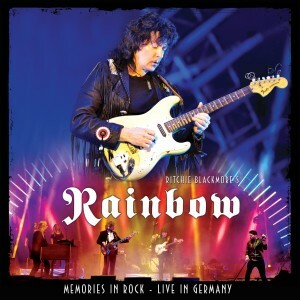 Sadly, it doesn’t appear that Blackmore will be bringing this new Rainbow formation to America. But at least we have these great European shows now documented in both audio and visual formats.